We set off on a warm afternoon in late October to take a closer look. Easy walk we’d been told and we didn’t even think to ask for directions … obvious wasn’t it? It turned out it wasn’t. There were some miles of confusion between road signs, satellite directions, steep suburbia, and strips of hotels. By mid-day we’d managed to get ourselves out of the ‘park-and-jump-on-a-bus-point’ and found our way up towards the ‘park-and-walk’ point. It had been a frustrating hour or so but nothing in comparison to what earlier tourists had faced to get to the top. Johann Goethe in 1787, Joseph Turner in 1819, Charles Dickens in 1845 and Mark Twain in 1875 had all managed to peer into Vesuvius without the aid of Tarmac. Our comfortable road hair-pinned us up towards the summit with thick bush and small trees to either side. It felt ordinary and slightly scruffy, not as though we were scaling the back of the legendary Vesuvius, the most dangerous volcano on mainland Europe. Vesuvius has erupted many times. The one in 79AD that buried Pompeii is amongst the best known thanks to eye witness report of Pliny the Younger who watched as his uncle, Pliny the Elder, sailed fatefully towards the danger. The last time Vesuvius erupted was in 1944. In eruption terms it was grand but not that grand. 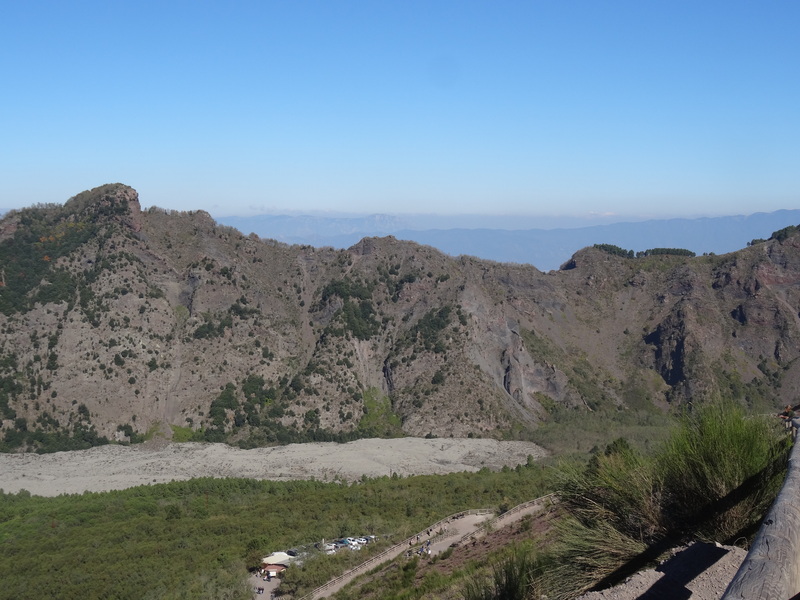 The experts believe that another extreme eruption is due and many are deeply worried about the lives and livelihoods velcroed on to the sides of the volcano. Science is doing its best to keep tabs on Vesuvius but can’t guarantee that she’ll give much warning when she next bids for the headlines. It’s all, even for the shoulder-shrugging optimist, a little unnerving. It’s not hard to understand the need for the signs, some scientific, some religious, in fact it’s ridiculously reassuring to see them tacked, tiny and hopeful, to the side of the great crater. 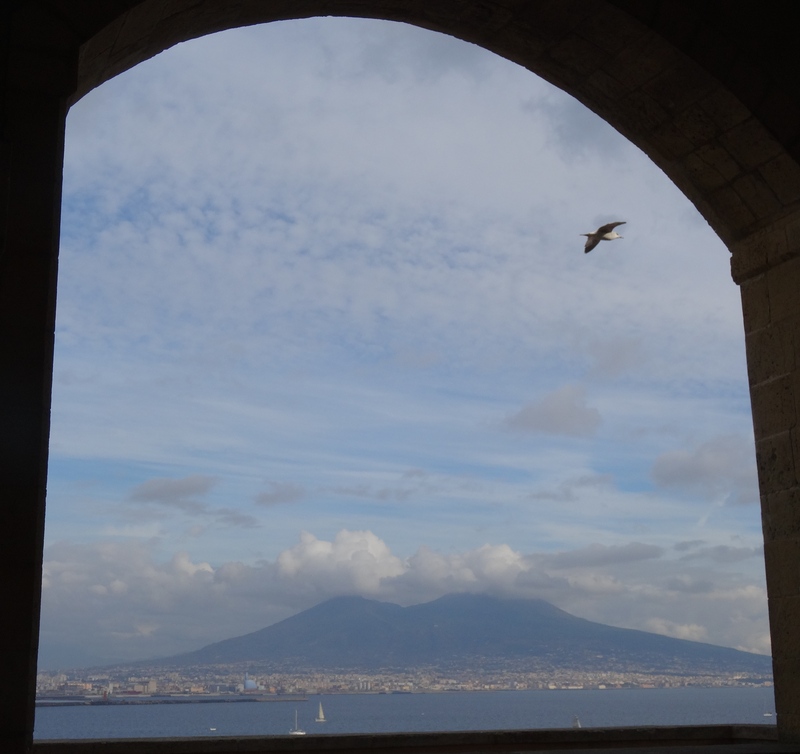 In the meanwhile, as we wait for the odds to be revealed, three things are certain: Naples will still creep towards Vesuvius; tourists will still climb its slopes; and artists will continue to be fascinated. In 2005 ten international sculptors were commissioned to produce a piece each for the Parco Nationale dell Vesuvio. Here are my two favorite pieces from the ten sculptures in volcanic rock. This entry was posted in Campania, Italy, Vesuvius and tagged Antonio Segui, Avellino, Castel dell'Ovo, Charles Dickens, Goethe, Lello Esposito, Mark Twain, Naples, Pliny the Elder, Pliny the Younger, Pompeii, Turner, Vesuvius. Bookmark the permalink. A look back (first published 25 November 2014): I think this piece should have gone under the heading “In Search of Vesuvius” because that is how it begins. Grazie! It’s such a pleasure to have a great city like Naples to write about, and even more of a pleasure to have you bothering to read through my excitements. Can’t tell you how much I value your time as I try to cling on to the learning curve – grazie ancora!